Bus from Johor Bahru to Segamat plays a major role in connecting people residing in the two cities. Though train from Johor Bahru to Segamat is available, people prefer to take the bus because of the limited choice of train schedule daily. KKKL Express and S&S International are two well-known players who run bus services from Johor Bahru to Segamat. They have become so popular because of their reliable and consistent of quality service. 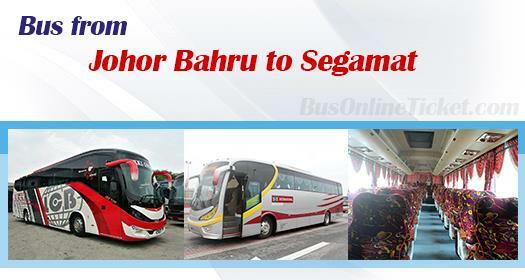 In fact, besides Johor Bahru to Segamat, they supply other reputable bus services like Johor Bahru to KL and Johor Bahru to Melaka. Other operators who also run bus services from Johor Bahru to Segamat are Cepat Express and Maraliner. The journey for bus from Johor Bahru to Segamat takes about 3-3.5 hours. The departure point in Johor Bahru is at Larkin Bus Terminal. After exiting at Yong Peng from North South Highway, the coach will take the old trunk road passing by Chaah and Labis before terminating at Segamat Bus Terminal. Segamat Bus Terminal is diagonally opposite the Segamat Train Station. Normally, coaches will go directly to Segamat without stopover along the journey, unless a washroom break is requested by passengers. The bus fare for a bus from Johor Bahru to Segamat costs in the range of RM 17.10 – RM 18.20. S&S International and Cepat Express both offer discounts for children at RM13.70 and RM12.80 respectively. During festive seasons like Chinese New Year or Hari Raya, bus fares may adjust slightly higher. Even though frequent Johor Bahru to Segamat bus schedule is provided for this route, passengers should not take the risk of buying tickets over the counter at the last minute. Ticket can be sold out very fast due to the high demand of the bus service. Passengers can simply book ticket online in advance at BusOnlineTicket.com to secure your seat.